Lithium Iron Phosphate Batteries often termed as LFP Batteries or LiFePO4 batteries have the service run time of more than 5 years. LFP offers good electrochemical performance with low resistance. These batteries have better thermal stability than other chemistries of Li-Ion Batteries. The nominal Voltage of single cell of LFP is 3.2V. The applications of these batteries are often seen in E-Mobility, Solar Energy Storage etc. The advantage of using these kinds of batteries is that it has a high current rating and long cycle life, it also has good thermal stability, enhanced safety, and tolerance in unfavorable conditions. Acknowledged for its long life span, 12.8V 16.5Ah LiFePO4 Battery Pack is preferred for its pollution free content, burst proof design and high-temperature proof body. Its application can be found in telecommunication backup storage system, emergency systems, solar energy storage unit and so on. 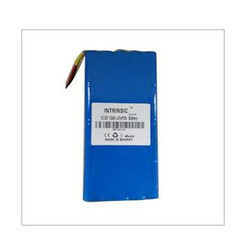 Light in weight, this battery pack has less self-discharging rate under low-temperature condition. Trouble free start up function, maintenance free quality, water and acid proof design, Eco-friendly nature, small and precise shape and burst proof design are its main factors. This Lithium Iron Phosphate Battery is preferred over lead-acid battery for its high energy storage capacity and better discharge rate. Its lithium iron phosphate-based content minimizes the possibility of combustion caused by short circuit and overcharge. This battery has less weight than lead acid battery. Smooth operation and high energy density are its key attributes. Being a quality driven organization, we are actively committed towards offering precision-engineered Lithium Iron Phosphate Battery. To keep in mind the various needs of the clients, this phosphate provides users with a safe, powerful, long lasting power solution. The provided phosphate is precisely engineered making use of premium class components and progressive technology under the strict supervision of adept professionals. The provided phosphate is duly checked against numerous parameters of quality to ensure its performance.